Cancer patients are waiting longer for potentially life-saving treatment compared to six years ago, according to a survey. The Royal College of Radiologists carried out an audit of all radiotherapy centres in the UK. It found that patients now wait two weeks longer for treatment in three out of four NHS centres. The government's cancer tsar said every effort was being made to tackle the problem. 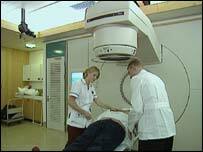 According to the survey, waiting times for radiotherapy have increased by two weeks in most cancer centres since 1998. Breast cancer patients now wait an average of five weeks for this treatment. Other cancer patients can wait up to six weeks. The college said an increase in the number of patients being referred for treatment and a lack of machines were to blame. The UK has traditionally had much fewer radiotherapy machines than other European countries. The government has paid for new machines. However, the college says much more are needed. "The additional provision, which has been made by the government, has just allowed the UK to stay in the same position as it was in 1998," it said in a statement. "Much of the new equipment has been replacement for old machines." The college called on the government to tackle the problem. "These waits for radiotherapy are unacceptable, causing distress and anxiety to patients and professionals responsible for their care." Professor Mike Richards, the government's cancer tsar, acknowledged that waiting times for radiotherapy "are still too long". "The increase in waiting times is related to a number of factors including the improvements we are making in other areas of cancer care which mean that more patients than ever before are being referred for radiotherapy. "This increase in patients, along with a shortage of specialist staff, is currently creating a bottleneck." He added: "We are doing everything we can to rectify this as quickly as possible by increasing the numbers of radiographers, improving facilities and equipment and redesigning services." But opposition parties slammed the figures. Shadow Health Secretary Tim Yeo said: "These statistics reveal how badly Labour has let down cancer patients." Liberal Democrat health spokesman Paul Burstow said: "This is a critical example of the hidden waits that do not show up on government statistics." He added: "The shortages of staff and equipment causing these long waits must be addressed." Dame Gill Oliver of Macmillan Cancer Relief urged the government to act. "We know that delays in waiting times are a cause of anxiety and distress, and can contribute to a less favourable outcome if urgent treatment is delayed," she said. "We need to see a renewed effort from the government."